H&M is proud to announce a special collaboration with fashion icon and legendary fashion director Anna Dello Russo. An idol of the blogosphere, whose flamboyant outfits are endlessly documented by style photographers and broadcasted globally on the web, Anna Dello Russo has once again demonstrated her unique sense of style by creating a special collection of accessories exclusively for H&M. Unabashedly glamorous, precious and playful, the range is an expression of Dello Russo’s taste for ornamentation. The collection will be available starting October 4th – the peak of the global Fashion Week tour – in approximately 140 stores worldwide and online. Dello Russo’s line will feature jewelry, sunglasses, shoes and bags, all designed so H&M customers can acquire unique style at an affordable price. “I am excited by this collaboration: this is the first time H&M has involved a fashion director in a special project. This is the sign of an important evolution in fashion, and I am both thrilled and humbled to be the one chosen to lead it. I wanted to create precious accessories that are impossible to find. As a stylist, I know accessorization is essential; it is the personal touch in any outfit. 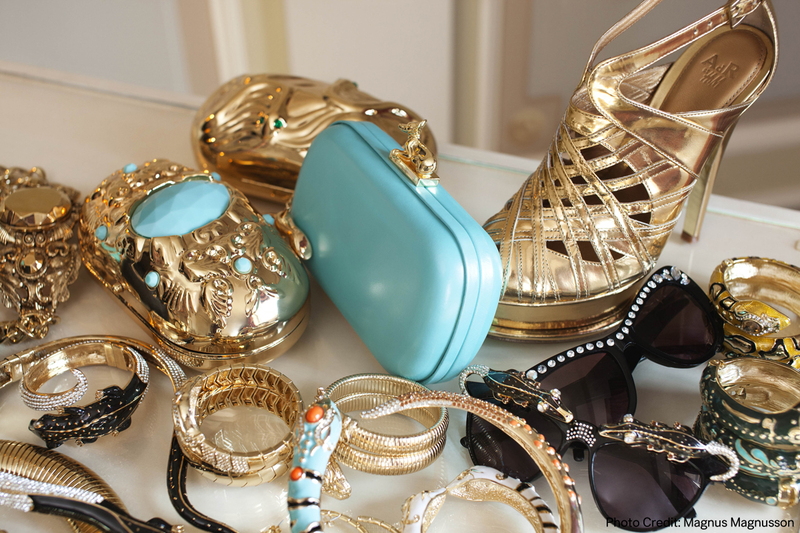 With these pieces, everybody can have fun, and turn an ordinary day into a fantastic fashion day”, says Anna Dello Russo. “It’s been extremely exciting to involve Anna Dello Russo in this project, something completely different from what we have done before. Anna has a fantastic eye and bold taste, apart from being a veritable fashion icon. She has produced an extravagant range of accessories that will thrill H&M customers and fashion enthusiasts everywhere. The collection is a celebration of excess, fantasy and decoration,” says Margareta van den Bosch, Creative Advisor at H&M. Famously described by photographer Helmut Newton as a “fashion maniac”, Anna Dello Russo is one of contemporary fashion’s driving forces. With an unparalleled eye, she has shaped the way we view fashion today – through her groundbreaking work at Vogue Italia, where she served as a fashion editor for over twelve years and worked with photographers such as Helmut Newton, Michel Comte, and Walter Chin, and later as Editor-in-Chief of L’Uomo Vogue. Currently performing the roles of Fashion Director at Large and Creative Consultant at Vogue Nippon, Dello Russo is a darling of the fashion bloggers, whom she likes to delight with her extravagant ensembles and countless changes of outfits during the world’s Fashion Week events.